Kongmo luau or Kongmala Pass Trekking is the most exciting and picturesque scenery in the Himalaya including views of Mount Makalu. The landscape is varied and spectacular; the lodgings and tracks range from the timeworn paths of the Khumbu, to the isolated and less frequented Kongma la section. Sometimes strenuous trekking is continuously rewarded with dramatic Himalayan scenes, including four of the world's eight highest peaks; Cho Oyu (8,201m), Makalu (8,463m), Lhotse (8,516 m) and Everest (8,848m). Time spent appreciative breathtaking mountain vistas are complemented by visits to Sherpa villages, homes and monasteries offering you an insight into the quiet but, culturally exciting Sherpa way of life. Asian Hiking Team organizes Kongma La pass trekking starting from Lukla and take two days to reach Namche Bazaar. Namche Bazaar is the Sherpa’s head quarter. Explore the National park office, monastery, Sherpa museum, Everest view point, homeland of Sherpa village Kunde and Khumjung need one full day for acclimatization. Continue walk to 4, 5 hours to reach Tengboche, the legendary monastery. Join the daily worship celebration in Tengboche monastery. Passing through the Pongboche village, recommend an acclimatization day in Dingboche the altitude of 4410m. From Digboche, trekking in Chhukum Valley, climb Calcium RI 5550m for preparation for Kongma La Pass. The strenuous day is long so need to bring pack Lunch. It takes 4, 5 hours to reach on the top and 4 to 6 hours need to reach Lobuje. The last part is very challenging as well as the moving rock on the way down to Lobuche. Trekking is into crossing the huge Khumbu Glacier to catch Lobuche. Either you visit Everest Base Camp and climb Kalapattar or continue down to Lukla with in 2, 3 days as your interest and time frame. Day 01: Kathmandu flight to Lukla (2840m) continues trek to Phakding (2640m) 3.30 hours, Overnight Lodge/Hotel. Day 02: Trek to Namche Bazaar (3440m) 5.30 hours, Overnight Lodge/Hotel. Day 03: Acclimatization day in Namche Bazaar. Day 04: Trek to Tengboche (3768m), 5 hours, Overnight Lodge/Hotel. Day 05: Trek to Dingboche (4410m) 5 hours Overnight Lodge/Hotel. Day 06: Acclimatization rest in Dingboche. Day 07: Trek to Chhukum (4730m) 3.30 hours to Chhukum Ri 5550m 3/4 hours Overnight Lodge. Day 08: Kongmala pass (5535m) and trek to Lobuche (4900m) 9 hours Overnight Lodge/Hotel. Day 09: Trek to Gorep-shep 3 hours continues to EBC (5370m) 2/3 hours return to Gorep-shep, Overnight Lodge. Day 10: Gorakshep climb to Kalapathar (5545m) on the way return Pongboche, 7 hours, Overnight Lodge/Hotel. Day 11: Pongboche to Khumjung 6 hours, Overnight Lodge/Hotel. Day 12: Khumjung to Phakding 4 hours, Overnight Lodge/Hotel. Day 13: Phakding to Lukla 3 hours, Overnight Lodge/Hotel. Day 14: Lukla to Kathmandu, Overnight Hotel. Day 01: Kathmandu flight to Lukla and trek to Phakding 2640m 3.30 hours, overnight guest house, hotel (B/L/D). Early morning, (40 minutes) flight from Kathmandu to Lukla (2840m). Meet our trekking crews’. After finish breakfast, to proceed from Lukla to Khumbu valley, head north, past a Chorten with praying wheels and join the main tail at Choplung (2696m) in less than one hour. The proceed head north crossing the Thado Khola (2554m) with the awesome trekking peak Kusum Khanguru (6483m). To reach Phakding (2640m), 1.30 hours from Choplung or almost 3.30 hours from Lukla. Overnight in Hotel in Phakding. Day 02: Trek to Namche Bazaar 3440m 5.30 hours, overnight guest house, hotel (B/L/D). To cross the west bank (right) of the Dudh koshi river, Continue through blue pine and rhododendron forests, pass a settlement if Metal worker (Tok Tok), village of Banker (2905m) with small lodge, see view of Mt. Thamserko (6856m) 1 hr. In the short while cross to the east (left) bank and climb up through Chumowa, cross the Khansar Khola to reach Monzo (2835m). Enter Sagarmatha national park here, 45 minutes from Banker. Descend in a cleft to the west (right) bank of Dudh Kosi on a suspension bridge to reach Jorsule (2774m) 30 minutes. Today we have early lunch at 11 O’clock. This is last village before Namche bazaar. After lunch proceed to cross Dudh Kosi (Bhote Kosi) again to the left side & again to cross the main Dudh Kosi, climb up till to Namche Bazaar (3440m), proceed in pine forest. We can see first view of Mt. Everest between Lhotse & Nuptse on the way to Namche. It takes 2 and half hours from Jorsule, overnight guest house, hotel. Today is rest day, however, we should do some activities such as to climb Syangboche airport, visit Sherpa home in khumjung/Khunde or view from Everest view point Hotel 2hr. Namche bazaar has many officials or offices, including army base camp and bank. Namche used to be trading center, where grain from the south was exchanged for salt from Tibet and it’s remains now a trading center. Every Saturday is market day. There is headquarter of Sagarmatha National park & Sagarmatha pollution controlled Project. Here is Sherpa Museum & monasteries too. Overnight Namche Bazaar. Day 04: Trek to Tengboche 3768 meter, 5 hours, overnight guest house, hotel (B/L/D). Today, we start our trek at 7.30 AM over the Dudh kosi river can see the Mt. Everest, Nuptse, Lhotse and Amadablam view. One and half an hour walk slowly going up to reach Kyanjugma and Sanaso. There is two ways, we follow right steeply down to Photse Tenga. Cross the Dhus Kosi bridge, we have lunch in there because of before Tyangboche there is not any sport for lunch. After lunch we climb up all the way to Tyangboche 3768m 2 hours. Tyangboche is very famous for view and the Monastery. Every day 6.30AM and 3.30 Pm is the Puja (praying time). We will join the Puja to success out trip, Overnight Lodge. Day 05: Trek to Dingboche (4410m) 5 hours, overnight guest house, hotel (B/L/D). Today, we start early around 7 to 8 o’clock. Half an hour down to Debuche, where is monastery and small settlements inside the alpine forest. After 45 minutes walk to cross the bridge, continues climb to reach lower Pangboche. We are not plan to visit Pongboche village because of we directly plan to go Dingboche. If you are so interest we can short visit as well, you can talk with your guide. Have a lunch in Somare and gradually walk up. There is two way, one heading to Pheriche and other is Dingboche. Right hand side direction is our way to Dingboche takes us 1.30 hour to our hotel. After our arrival, have a short drinks with rest and climb 200 meters over the Nagarjun hill because of everyday we “ascent high and sleep in low” Overnight guest house. Day 06: Rest day in Dingboche (B/L/D). Today is rest day, we can visit the Monastery over the hill top its takes 2/3 hours to see the view of Mt. Makalu which is above 8000m High Mountain or we can explore opposite of Dingboche, cross the Imja Khola and steeply climb in-fount of Amadablam Mountain, overnight Lodge/hotel. Day 07: Trek to Chhukum 4730m, climb Chhukum Ri 5550m 3.30 plus 2/3 hours trekking, overnight guest house, hotel (B/L/D). Today, our trekking heading us in Island Base Camp gradually climb to Chhukum (4730m) 3.30 hours. We have lunch in Chhukum then after climb to Chhukum Ri 5550m (2/3 hrs) which is our first high trekking Mountain in your trip, Overnight Lodge. Day 08: Kongma la Pass 5535 meter overnight in Lobuche (4900m) 8-10 hours, at guest house, hotel (B/L/D). Today we have hot breakfast before sunrise. First an hour gradually climb and some time steeply climb to reach Lake. Walk bank for the lake and steeply difficult climb to reach top of Kongmola. From top of Kongmola can see both side most beautiful mountain. Mt. Makalu, Amadablam is carry on and on next side can see mt. Cho-Yu, Pomori and more. But Mt everest Lhotse and Nuptse is on the forehead of you. After few minutes rest and have picture, we walk down over the moving rock to catch Khumbu glacier. We recommend walking slowly as well as being careful. Over the glacier to reach the huge busy places call Lobuche (4900m) 8 - 10 hours. We have very late lunch in Lobuche so recommend to use your chocolate, cookies and bring enough water. Our guide manage day lunch too. Overnight Lobuche. Day 09: Trek to Everest Base Camp (5365 meters) then trek back to Gorak Shep (5180 meters), 7 hours, overnight guest house, hotel (B/L/D). Early in the morning leaving Lobuche, after lunch in Ghorap-shep within 3 hours we will head up to Everest Base camp (5365 meter), and return to Ghorak-shep at elevation of 5180 meters at noon for our overnight stay. We walk over the moving stone with jump so it does hard be careful to walk. Overnight at Guesthouse with breakfast, lunch and dinner with hot drinks. Day 10: Trek to Kalapattar (5545 meters) then trek down to Pongboche (3960 meter) 6 hours, overnight guest house, hotel (B/L/D). After reaching Base camp of Everest our aim today is to trek Kalapattar (5545 meter). We start early morning before sunrise to reach the viewpoint that offers some of the best views of Mount Everest as well as other panoramas of the surrounding mountains. Kalapattar means “Black rock”, most excellent view point in the world. After late breakfast descend to Pongboche through Pheriche at elevation of 3960 meter 6 hours, Overnight at Guesthouse. 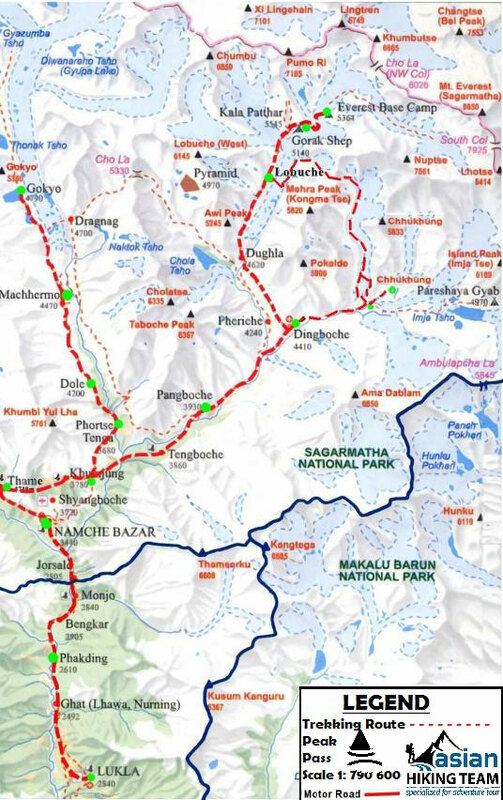 Day 11: Trek to Khumjung 3830m, 5 hours, overnight guest house, hotel (B/L/D). Today, we follow in the mountain side not come to lower Poanboche, within 2 hours bring you in Photse. Half an hour walk down to Photse Tenga the way to go Gokyo valley and steeply climb to reach the best view point. Continues walk to Khumjung valley. Overnight O/N Lodge, 6 hours trekking on elevation of 3780 meters. Visit the Adman Hillary school and monastery in the evening. Day 12: Trek to Phakding 2640m 5.30 hours, overnight guest house, hotel (B/L/D). After breakfast trekking to the Namche Bazaar after that we return back same way to Phakding 5.30 hours, Overnight guest house. Day 13: Trek to Lukla 2840m 4 hours, overnight guest house, hotel (B/L/D). Finally, we return to Lukla where the trek began, which seems a lifetime ago. Enjoying time rest of trip, Overnight at Guesthouse with cold & hot drinks. Day 14: Fly to Kathmandu, overnight guest house, hotel (BB). Early morning flight back to Kathmandu and free, shopping day.